Drab offices are a remnant of a professional depression that has thankfully passed: the realisation that an anachronistic office environment is detrimental to the wellbeing and productivity of a workforce has encouraged employers to take action. Company owners are becoming increasingly aware that inspiring surroundings are a worthy investment. Nowadays, creative design permeates an increasing number of office spaces in the City of London and stimulates workers’ creativity and collaboration. While space planning and design can be an unfamiliar undertaking for many, there are simple measures that businesses can take to install a sense of creativity in the design of their office. The most forward-thinking companies use creative office design to augment their professional image and to create a stimulating place for employees to work. Even seemingly small touches – like matching office decor to your brand’s colours and style – can enforce the company’s sense of professionalism, while enhancing team spirit and employees’ loyalty. 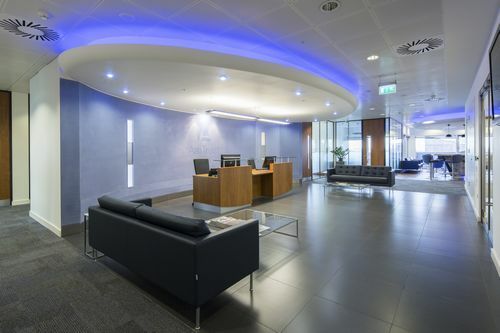 The US-based insurance group AmTrust Financial Services evolved into a multi-national business and needed a new London office to reflect its brand image in line with its American headquarters. Every aspect of the design – from its purple colouring, which replicates the colour brand’s logo, to the open break areas and expansive reception – emphasises the core values of the company: innovation, professionalism, and a commitment to excellence. Workers’ and clients’ perception of a company is greatly affected by office design; a creatively designed office affects trust in a company. Supporting different working styles by creating alternative workspaces can have a direct impact on focus, productivity and collaboration. A recent study found that when collaborative spaces and individual workstations are discordant in the office design, it is to the detriment of overall productivity. The conclusion is that office designed should facilitate collaboration while enabling individual workers to focus too. It is therefore essential to make sure that both types of area are provided, but in a harmonious way. 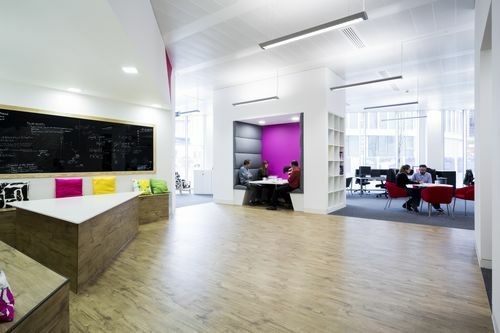 EMO & TRA marketing specialists in Bristol have complemented an open-plan office design with private booth spaces. This means individual work can be done free from noise pollution and the distraction of others. The pods are creatively designed and inspiring with bright colours and high ceilings to promote a sense of freedom and innovation. Noise can be a problem in large offices. 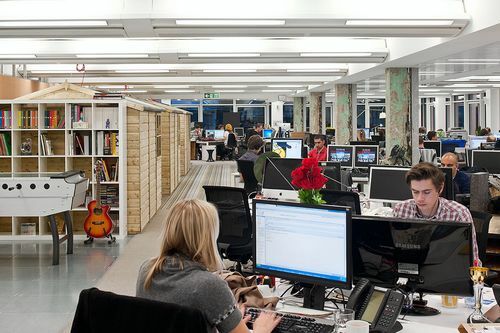 As outlined by Forbes, between 25% and 30% of employees working in an open-plan office are unhappy with noise conditions. Some people need a quiet environment or gentle ambient background noise in order to fully concentrate. Soundproofing walls can go a long way in boosting employee productivity, but there are more creative steps you can take. Natixis’ Global Asset Management (NGAM) utilise acoustic-controlling screens to absorb noise and improve employees’ motivation. Break rooms are often an overlooked feature of the workplace. However, staff who are well-rested and take regular short breaks from work tasks are generally more focused and productive. It also reinforces a culture of collaboration, as employees meet in relaxation areas to converse. 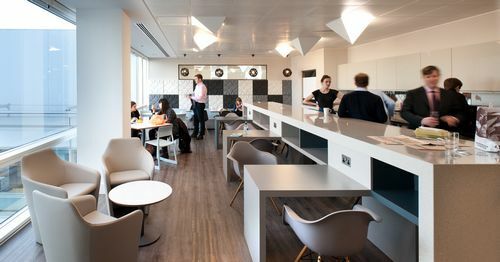 The Salamanca Group encourages staff to relax at a 9m stone breakfast bar, which starkly contrasts with the office’s individual work areas. As a result, it has become a meeting point for workers to exchange ideas. EDC Communications took a different approach: the office has break areas as part of the open floor plan. The company has provided table football and other games so that work and play are closely intertwined. The result? Employees feel relaxed while at work. Happy employees are more loyal and productive.